A woman, 20, was charged in a fatal crash in May 2014. PLEASANTVILLE, N.J. (WPVI) -- A woman has been arrested and charged following a crash on Memorial Day 2014 that left three teenagers dead. Melissa Rodriguez, 20, of Egg Harbor Township is charged with three counts of vehicular homicide. 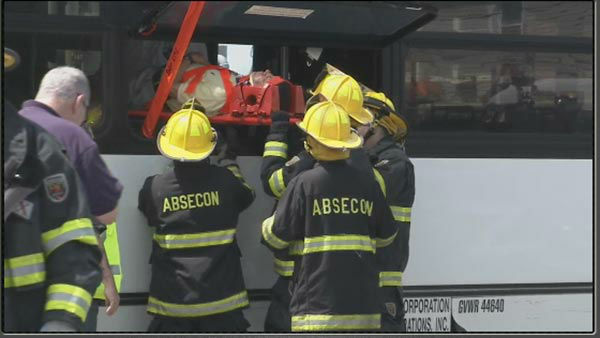 The Action Cam was on the scene after a fatal crash involving a car and a bus in Pleasantville, New Jersey. Atlantic County prosecutors say Rodriguez also faces two counts of assault by auto in an indictment handed up Wednesday by a county grand jury. It was made public on Monday. The charges stem from the May 2014 crash in Pleasantville. Three teenage passengers in Rodriguez's car were killed when she allegedly crossed the center line and struck the bus, which had eight passengers aboard. Rodriguez was arrested Friday and released later that day after she posted $50,000 bail. Her attorney, Steve Scheffler, said he was surprised by the indictment because he had been led to believe several months ago that prosecutors had decided not to pursue criminal charges.